We wanted to know, and you told us. Earlier this year, we published a list of 240 bird species that occur in the United States and Canada and asked you to choose the 10 that you wanted to see most. We derived our list from the authoritative checklist published by the American Birding Association. We included all rare, casual, and accidental species (ABA Checklist Codes 3, 4, and 5); regularly occurring North American species that are not widespread (Codes 1 and 2); and one species that was once dangerously close to extinction but today is surviving in captivity and struggling to become naturally re-established (Code 6). We omitted most species not native to North America. Nearly 900 readers participated. 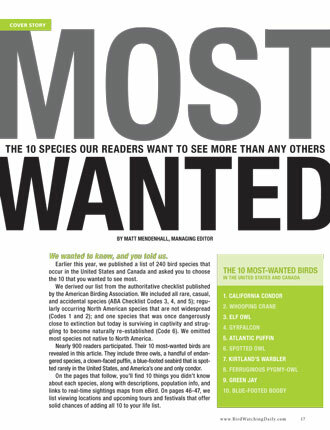 Their 10 most-wanted birds are revealed in this article. They include three owls, a handful of endangered species, a clown-faced puffin, a blue-footed seabird that is spotted rarely in the United States, and America’s one and only condor. 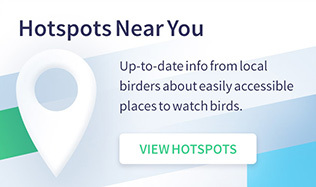 Below you’ll find 10 things you didn’t know about each species, along with descriptions, population info, and links to real-time sightings maps from eBird. 1. If species were named based on their fossil histories, we’d almost certainly refer to this bird as American Condor. Its bones have turned up not only in California but also in Arizona, Nevada, New Mexico, Texas, Oregon, and Florida and near Buffalo, New York. 2. For tens of thousands of years, it fed on the carcasses of mammoths, American lions, and other giant mammals that are all now extinct. 3. The extinction of much of its prey and the influence of early Native Americans, who used condor feathers for ceremonial clothing, likely restricted the condor’s range to the West: around 1800, it occurred from southern British Columbia to Baja California. 4. Beached marine mammals such as whales and sea lions provided a steady source of food into the 19th century. 5. The mid-1800s California Gold Rush inadvertently led to the condor’s near extinction. As people poured into the state, they shot deer, elk, and antelope using lead ammunition, and unrecovered carcasses and gut piles became food for scavenging birds. Hundreds of condors likely died from lead poisoning after consuming bullet fragments. 6. Even more died after eating the carcasses of coyotes, cougars, and other animals that had been deliberately poisoned to prevent them from taking livestock. 7. 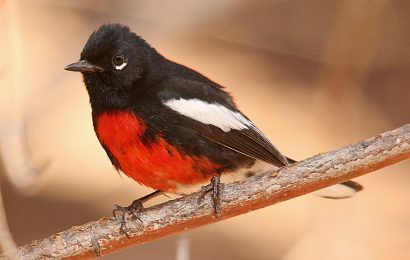 Lead poisoning was the likely cause of the great bird’s decline to 22 individuals in 1982. And since 1992, when wildlife officials began releasing condors back into the wild, lead poisoning has continued to be a primary reason for the bird’s limited recovery. 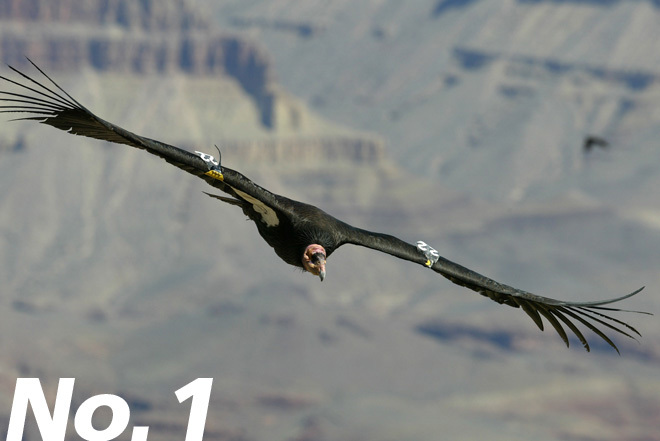 A 2012 study attributed two-thirds of adult condor deaths to lead poisoning. 8. In 2007, the state of California tried to help by banning the use of lead shot within the condor’s range, but researchers last year found that the ban has had no measurable effect on lead levels in condors. Lead poisoning in condors, they concluded, is of “epidemic proportions.” 9. The condor recovery team is considering releasing birds in Oregon — part of their historic range. 10. The results of a recent study may give the team pause. The authors found that the blubber of beached sea lions, harbor seals, and other marine mammals — potential condor food — contains high levels of PCBs and the pesticide DDE. Range: Central and southern California, Grand Canyon, southern Utah, Baja California. Population: Wild: 223 (70 in Arizona and Utah, 123 in California, 30 in Baja California). Captive (including birds temporarily in captivity): 201. Total: 424. Endangered. 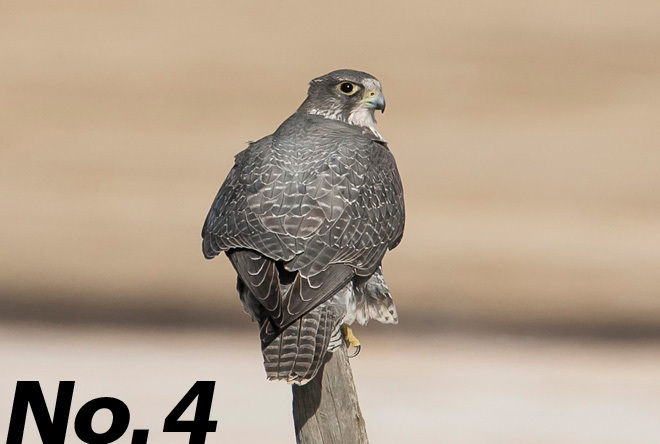 Population count updated regularly by the Peregrine Fund. 1. Although we think of Whooping Cranes today as birds of marshes, historically they were found on North American grasslands. 2. Their breeding range extended from central Illinois and Iowa into Minnesota, North Dakota, Manitoba, Saskatchewan, and Alberta. 3. An isolated breeding population also existed in southwestern Louisiana and eastern Texas, and it likely wasn’t the only one. Prior to the 1860s, birds were reported near the western shore of Hudson Bay, on the Bear River in Idaho, and near Ocean City, New Jersey. 4. In winter, Whoopers occupied two regions: the intermountain grasslands of central Mexico and the Gulf Coast from northeastern Mexico to Alabama. 5. Despite its vast range, the crane’s total population in the mid-1800s is believed to have been no more than 1,300-1,400 birds. 6. Within a century, settlers plowed and drained the bird’s habitat and shot more than 250 cranes. By 1941, only 16 birds returned to winter on the Texas coast. 7. Scientists have known the crane’s migration route since 1954, when the Canadian breeding grounds were discovered. In the last couple years, a tracking project using solar-powered GPS transmitters has revealed details about timing, stopover sites, and migratory behavior. The ongoing study aims to inform conservation decisions along the migratory corridor. 8. For more than 60 years, the flock wintering at Aransas National Wildlife Refuge was counted in an annual census, which, over time, showed steady growth; by the winter of 2010-11, the census tallied a record 282 Whoopers. 9. The following year, the U.S. 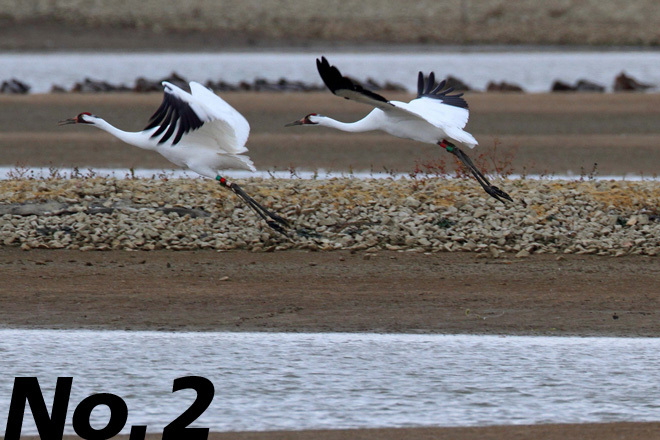 Fish and Wildlife Service switched to a survey method known as distance sampling; rather than counting every bird, it aims to count most cranes and produces an approximate total. In 2012-13, officials estimated the Texas population at 273 cranes, but the number may have been as low as 250 or as high as 301. 10. In the two years since 282 cranes were counted, the population may have risen by almost 7 percent or it may have dropped by 3 percent or an astonishing 11 percent. “This degree of uncertainty is simply unacceptable and useless for recovery management purposes,” says Tom Stehn, retired Whooping Crane coordinator of the Fish and Wildlife Service. Range: Wood Buffalo National Park, Alberta and Northwest Territories. Aransas NWR, Texas. Reintroduced flocks in Wisconsin, Florida, and Louisiana. Population: Wild: approximately 273 in the flock that migrates between Texas and northern Canada. Reintroduced flocks: 106 in the eastern migratory population, 28 non-migratory cranes in southern Louisiana, and 20 non-migratory birds in central Florida. Captive: 183. Total: About 610. 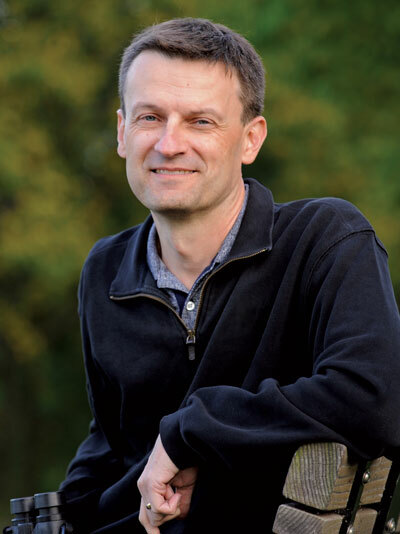 Read an interview with George Archibald, co-founder of the International Crane Foundation. 1. To avoid being eaten or having their nests raided, small birds often gang up on larger birds or other predators. The behavior is known as mobbing, and it works because the predators are typically chased away. Elf Owls in groups of 3-6 have been known to mob Great Horned Owls, which are 35 times heavier, as well as gopher snakes and raccoon-like ringtails. 2. Not many birds are both mobbers and mobbees, but Elf Owls are. American Robins, Bridled Titmice, and Black-throated Gray Warblers have been observed mobbing Elf Owls. 3. It’s easy to understand why Elf Owls would mob larger birds: Great Horned Owls, hawks, and Mexican Jays will prey on adults and nestlings. 4. Why songbirds bother mobbing Elf Owls is curious; the small owls eat primarily moths, beetles, and crickets and have not been reported preying on birds. 5. 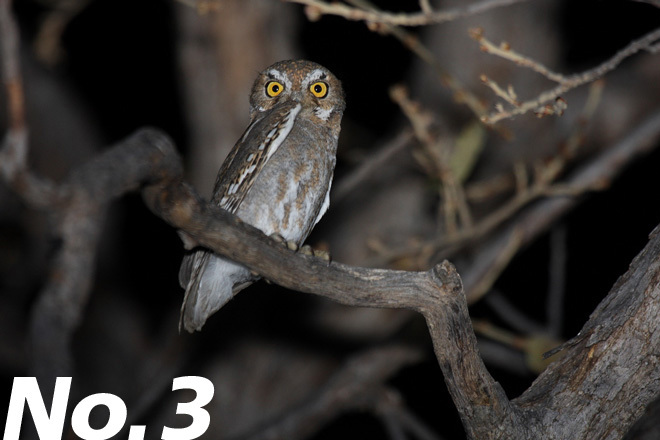 In southeastern Arizona, Elf Owl is easiest to find from late March through mid-July, when it is most vocal. It remains in its breeding range in the United States until early October, when it migrates to Mexico. 6. Its migration routes are unknown, but it has been reported in spring and late summer in flocks. (How cool is that?) 7. The species was once reliable along the lower Colorado River in southern Nevada, southeastern California, and western Arizona, but it’s rare in the region now. In the 20th century, the bird lost out to water diversions, invasive plants, and development along the river. 8. In fact, it was listed as Endangered in California in 1980. 9. In 2004, the U.S. Bureau of Reclamation launched efforts to restore native plants and animals, including Elf Owls, along the river valley. Two of the goals are to create no less than 1,784 acres of Elf Owl habitat and to install lots of nest boxes. 10. 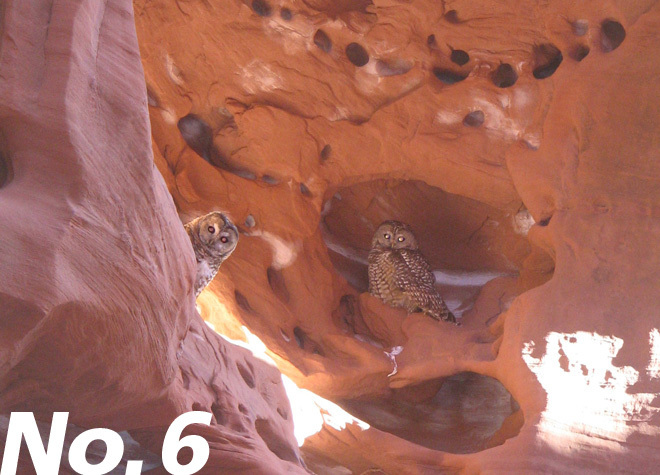 In the spring of 2010 and 2011, researchers from the Great Basin Bird Observatory made detailed observations of owls and their habitats on the nearby Bill Williams River National Wildlife Refuge in western Arizona. The study was a critical step toward returning breeding Elf Owls to the lower Colorado River valley. Range: Lower Colorado River, from southern Nevada, eastern California, and western Arizona, east to the Rio Grande River in New Mexico; Big Bend region of Texas east to Edwards Plateau and north to the Davis Mountains; Dimmit County, Texas, south through the Rio Grande, to Nuevo León, Mexico; southern region of Baja California; and western Mexico. Range: Breeds in arctic regions from Alaska to Greenland, Scandinavia to Sibera. Winters in Canada and the northern United States and across a wide swath of central Eurasia. Population: Estimated world population 7,880-10,900 pairs (2005). 1. A colorful, triangular bill is this bird’s most distinguishing feature. The size of the bill and the number of grooves in it increase as the bird ages, factors that puffins may use to assess potential mates. 2. Project Puffin, a productive effort to return puffins to Eastern Egg Rock and other nesting islands off the coast of Maine began in the 1970s and ’80s. Its success has depended, in part, on “puffineers,” observers who live on the island all summer and work hard to keep Great Black-backed and Herring Gulls at bay. The gulls prey on puffin chicks. 3. The puffineers probably never expected they’d also have to deal with river otters, but last summer they did. Two marauding otters, the first ever observed on Eastern Egg Rock, ate adult puffins and chicks, reducing the population from 123 to 104 breeding pairs before they were removed in July. 4. A more worrisome threat for puffins is rising sea temperatures. 5. Puffins thrive in seas between 32-68° F (0-20° C). In 2012, biologists recorded the warmest waters to date for the Gulf of Maine and documented the earliest-ever plankton bloom. 6. This caused butterfish, a favored prey, to grow faster sooner. When the birds brought the butterfish back to their burrows, many were too big for the chicks to swallow. 7. No matter what they’re catching, prime fishing hours for puffins are 4-8 a.m. and 4-8 p.m., according to a recent study in which temperature depth recorders were affixed to birds’ legs. 8. 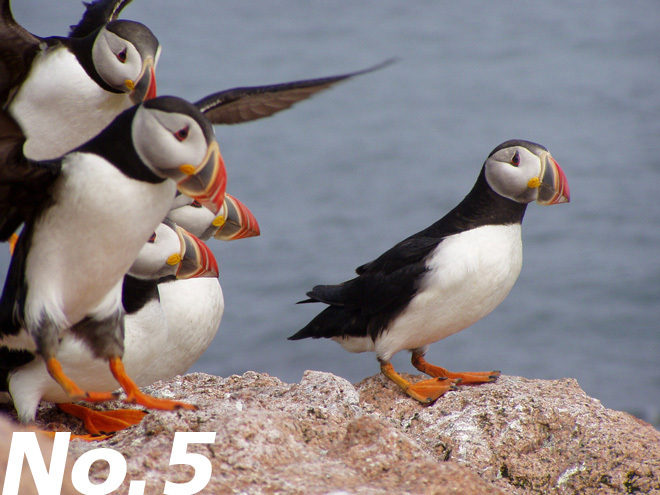 Puffins remained underwater for less than a minute and dove to an average depth of 33 feet. 9. Little is known about puffins’ whereabouts after the breeding season, but huge flocks have been spotted southwest of Greenland and between Greenland and Iceland, suggesting they sometimes gather in great numbers. 10. More insights into winter movements were gained recently when geolocators were retrieved from two puffins at Seal Island National Wildlife Refuge. The devices showed that the birds had flown north into the gulfs of Maine and St. Lawrence, and one winter, one of the birds continued north into the Labrador Sea. Range: Breeds off the coasts of Maine, eastern Canada, Green- land, Iceland, Britain, and northern Europe. Winters at sea. Population: Approximately 500,000 in North America, mostly in Newfoundland and Labrador. 3-4 million worldwide. 1. If you were to play a word-association game in which you tried to match bird species to the geologic wonders of the world, it’s a safe bet that Spotted Owl would not be top of mind when you heard “Grand Canyon,” yet owl-detection surveys suggest that more than 200 Mexican Spotted Owls live in Grand Canyon National Park. 2. It’s the most common owl species within the park. (There’s another word rarely associated with Spotted Owl: common.) 3. 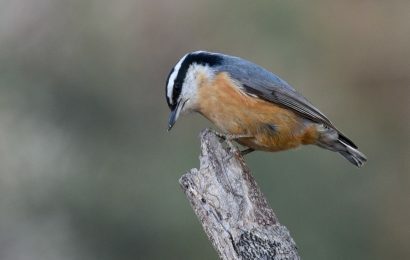 The bird uses “narrow, steep-walled canyons where ledges and caves provide cover from high temperatures, as well as nest sites and foraging habitat,” according to avian ecologist David W. Willey and biologist R.V. Ward. “In essence, complex, rocky terrain has been substituted for old-growth forest.” 4. Willey and Ward conducted their surveys by imitating the owl’s calls and listening for responses — a common survey method across the range of Spotted Owl. 5. A research paper published last summer suggests a better survey method is to familiarize dogs with the scent of owl pellets and let them sniff the forest floor. Invariably, the pooches found owls that vocalization surveys missed. 6. Over the last three decades, scientists have researched Spotted Owl so intensely that today it has the distinction of being one of the most-studied owls in the world. 7. About 10 years ago, biologists from the U.S. Geological Survey and the U.S. Forest Service investigated the genetic differences among the three subspecies. They found that Northern Spotted Owl is a true subspecies and that the California and Mexican groups, despite being geographically isolated from one another, form a second genetic subspecies. 8. Northern Spotted Owl, the researchers concluded, split from the California and Mexican group around 115,000-125,000 years ago. 9. At one time, California and Mexican Spotted Owls occurred together and went their separate ways only about 15,000 years ago. (Despite the genetic similarities, the researchers say it’s appropriate to continue managing the birds as separate subspecies.) 10. The genetic study also found that California and Northern Spotted Owls hybridize in the area where the two groups meet: the Klamath ecoregion of southern Oregon and northern California. Range: Southwestern British Columbia to central and southern California, New Mexico, Arizona, southern Utah, southwestern Colorado, western Texas, and eastern and central Mexico. Population: No current data. Surveys in the 1990s counted at least 12,400 individuals total. Northern and Mexican Spotted Owl subspecies are listed as threatened; a third subspecies, California Spotted Owl, is not listed. Read more: Will killing Barred Owls help Spotted Owls? Range: Breeds in the northern portion of lower Michigan, the state’s upper peninsula, central Wisconsin, and eastern Ontario. Winters on Eleuthera and other islands in the Bahamas. 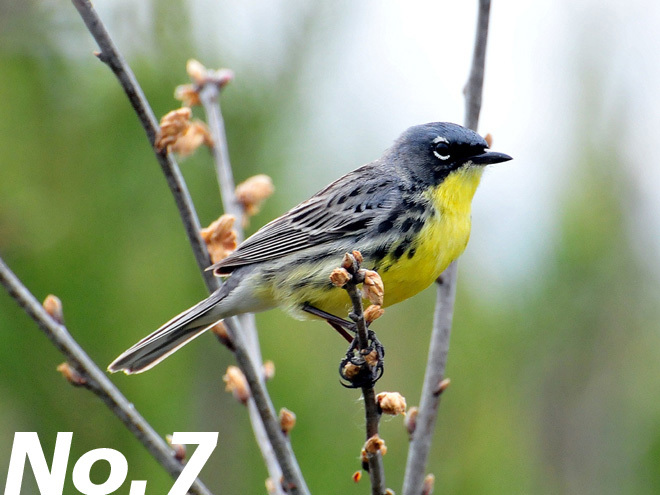 Population: 2012 census: 2,063 singing males in Michigan, 23 in Wisconsin, 4 in Ontario. Total: 2,090. Endangered. 1. Ferruginous Pygmy-Owl is the Spud Webb of birds. Webb, all five feet seven inches and 133 pounds of him, played 12 seasons in the NBA, in which the average player is a foot taller and 90 pounds heavier. The pygmy-owl is no bigger than a bluebird and weighs about 2.5 ounces, yet it has been known to prey on the larger and significantly heavier Gambel’s Quail and hispid cotton rat. 2. Ferruginous Pygmy-Owl feeds mainly on grasshoppers and also eats scorpions, cicadas, reptiles, and birds. 3. A study conducted on the King Ranch in Texas recorded the owl preying on Northern Cardinal, Blue Grosbeak, Eastern Meadowlark, and other songbirds. 4. The owl uses a perch-and-pounce hunting method, and it raids nest cavities of Golden-fronted Woodpecker and other birds. 5. To fool its prey, Ferruginous Pygmy-Owl evolved so-called false eyes: patches of dark feathers on the back of its head that look like eyes. 6. In recent decades, the subspecies known as Cactus Ferruginous Pygmy-Owl declined substantially in Arizona and was listed as Endangered between 1997 and 2006. Last year, environmentalists filed suit calling for it to be listed again. 7. Unfortunately, populations across the border in Sonora, Mexico, dropped 36 percent from 2000 to 2009, according to a report by University of Montana biologist Aaron Flesch. 8. Unless Sonora’s numbers rebound, he writes, it’s unlikely that owls will be translocated from Sonora to Arizona to help the species recover in the state. 9. Another challenge: In the time when the species was listed but before critical-habitat protections took effect under the Endangered Species Act, many landowners near Tucson developed their land, making it much less suitable for owls. 10. 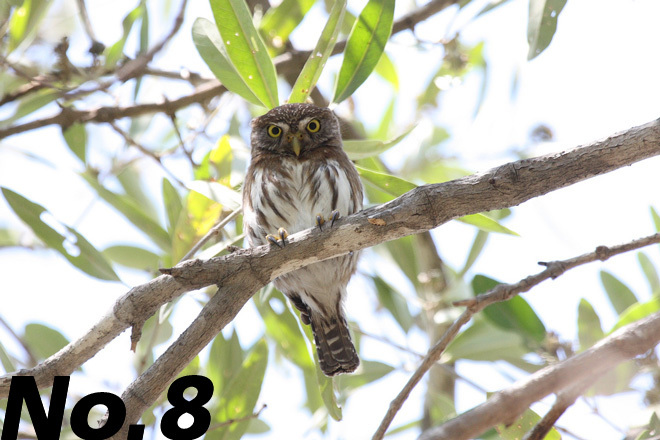 Today the big bird-friendly ranches of South Texas are the best places to find Ferruginous Pygmy-Owl in the United States. Since floods along the Rio Grande in July 2010, the species has been absent from its traditional haunts near the Mexico border, including Bentsen-Rio Grande Valley State Park and Santa Ana National Wildlife Refuge. Range: South Texas (Kingsville), southern Arizona, Mexico to Argentina. Population: Not well known, but common in most of its range. 1990s estimates in South Texas: up to 1,800 owls. Currently about 20 in Arizona. 1. Green Jay is one of many bird species that use tools. In 1981, University of Missouri biologist Douglas Gayou watched an adult jay insert a twig beneath a piece of bark to extract and eat insects. (A juvenile tried to get a meal in the same way but was unsuccessful.) 2. Gayou was the first to report tool use by wild jays. 3. Green Jay also has an unusual family system, Gayou found. After fledging, young birds remain with their parents for a year. While the parents raise a new set of offspring, the year-old birds defend the territory but don’t feed the young chicks. 4. Several weeks after the new young fledge, the adult male drives away the year-old jays, and the process starts again. 5. 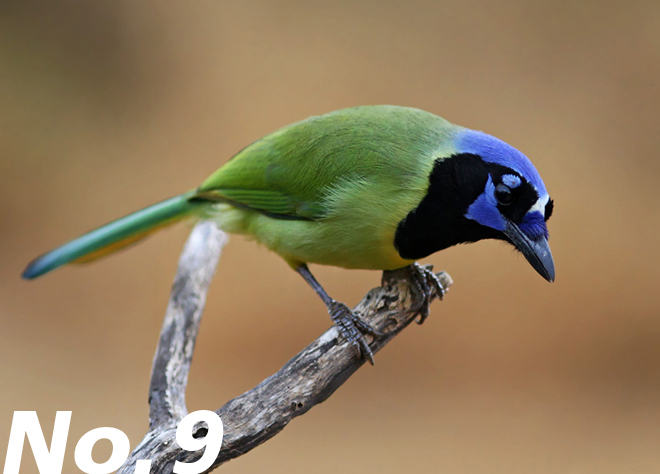 Gayou suggests Green Jay is on an evolutionary path toward cooperative breeding, a family system in which yearling birds help raise and feed their parent’s next offspring. Species that have developed cooperative breeding include Florida Scrub-Jay, Brown Jay, Mexican Jay, and so-called Inca Jay, the South American subspecies of Green Jay. 6. It is distinct from the northern bird not just in breeding strategies and range but also in plumage, habitat, and vocalizations. 7. 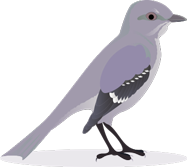 The authors of a 2010 paper on the genetics of birds in the genus Cyanocorax say Green and Inca Jays probably are distinct species but that more research is needed before the matter can be resolved. 8. Green Jay’s range expansion in Texas during the last 40 years is, in a word, stunning. 9. A century ago, the species was restricted to the Rio Grande Valley. In the 1970s and ’80s, the northern edge of the range was near Kingsville, southwest of Corpus Christi. Since then, it has spread north and east, and today, it occurs near San Antonio — 225 miles north of the Rio Grande. 10. Green Jay isn’t alone. 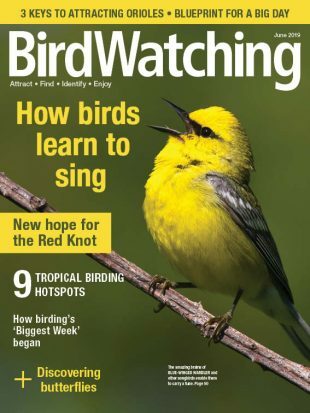 About 70 bird species are expanding their ranges north and east in Texas, according to a recent study by ornithologists John Rappole, Gene Blacklock, and Jim Norwine. They point to the warming climate as the likely cause and say the long-term consequences could be profound. Range: South Texas, Mexico, Belize, Guatemala, and Honduras. 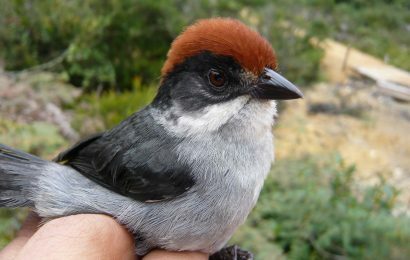 Inca Jay subspecies from Venezuela to Bolivia treated as a separate species by several authors. Population: Unknown but said to be increasing. Range: Pacific coast from Mexico to central Peru, especially the Gulf of California, Galapagos Islands, Honduras, and Panama. In Mexico, common in the Gulf of California and on the coast from San Blas south to Oaxaca. Population: Fewer than 40,000 pairs worldwide (2001 estimate). 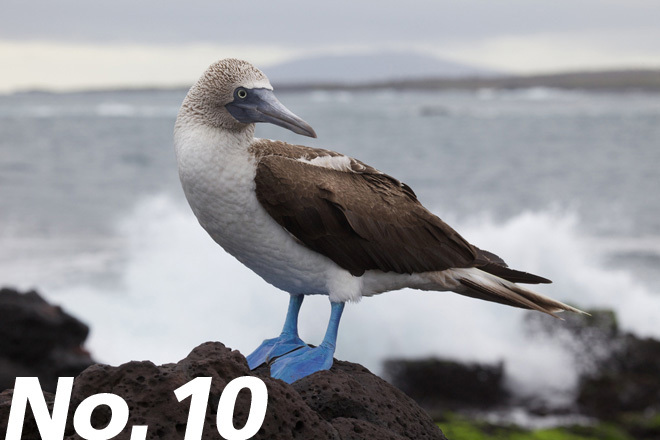 Preliminary data from a new Galapagos study indicate 6,000-10,000 birds are on the islands. This article appeared in our August 2013 issue. Posted October 30, 2013.